NOTE: Not played on the original NES, but on the PS4 version from the Disney Afternoon Collection. Capcom is no stranger to sequels: Mega Man had six entries alone on the NES and your head would probably start spinning trying to recall all the sequels, spin-offs, remasters and adjective themed updates for the Street Fighter franchise. One side of Capcom’s business that never saw that level of sequel churn was their Disney licensed games. DuckTales was released in North America in 1989 and it never got a sequel until the summer of 1993 at a time when most had moved onto 16-bit consoles like the Super Nintendo or Sega Genesis and the show had long since ceased adding new episodes. 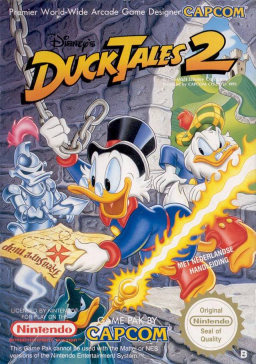 Because it such a late NES release, DuckTales 2 became nowhere near as popular as its predecessor, and by the time it gained awareness, it was out of reach for many as the price for the cart soared up to several hundred dollars on sites like eBay and Amazon. DuckTales 2 is a worthy sequel to the original game that is nowhere near as memorable as the original outing and also not worth the high asking price. Thanks to the Disney Afternoon Collection though, you can now play DuckTales 2 for a small fraction of what the NES cart is being sold for and for those who played the first game to death and never played chapter two, now is as good a time as any to correct that. One thing that DuckTales 2 does immediately better than the first game is communicate story. For the first DuckTales, the story was very limited and only found within the instruction manual. While chapter two can more or less be summed up as “Uncle Scrooge wants to get even richer again”, there’s a far greater attempt from Capcom in providing context as to why Scrooge has returned to his treasure hunting ways, including text that sets up the game and describes the treasure, and dangers, found within the levels you travel to. What’s weird about some dialogue bits though is how people refer to Scrooge. Both Launchpad and Gyro Gearloose refer to Scrooge as “Uncle Scrooge” but they’re not related to him. It’s a simple thing, but a little backwards from the first game when you talk to Launchpad and he refers to Scrooge as “Mr. Mc D”. Scrooge McDuck’s nephews discover a piece of a treasure map left behind by one of Scrooge’s ancestors, Fergus McDuck, that leads to the lost treasure of McDuck, however the remaining pieces of the map are scattered all over the world along with newly undiscovered treasures. Scrooge sets out to find the remaining pieces before the likes of rivals such as Flintheart Glombold do along with his trusty pilot Launchpad McQuack and company. Those who played the first DuckTales will immediately feel at home with the sequel as it plays much the same but with a welcome refinement and new moves in Scrooge’s repertoire. The most noticeable improvement is that you no longer have to hit down plus the B-button to initiate your pogo jump; Just jump and hold B and Scrooge will immediately switch to pogo mode and after this control change, it’s admittedly hard to go back to how it was in the first DuckTales. You’re cane can also do more things in the sequel like allowing Scrooge to hang from designating hooks in a few areas, operate levers, and use objects to catapult you across long gaps. Your tool of choice can also be upgraded to break and pull objects by finding Gyro Gearloose within certain levels. Hooks like these make Scrooge’s cane far more useful than in the original game. Money also plays a far more important role in DuckTales 2. Whereas in the original game it was just used for score and unlocking a little bit extra in the ending, in the sequel money found within stages can be used to buy things in a store between levels like extra lives, extra hits, and even continues such that you don’t have to start over from scratch the second you lose all your lives. The caveat is that in order to keep the money you find within a level, you have to buy a safe, but they’re fairly inexpensive to the point where you have to wonder why Capcom even bothered to put this limitation in at all. DuckTales 2, like a lot of the Mega Man sequels on the NES, feels like more of the same, which isn’t a bad thing in either series, but the new mechanics and shop help make it stand on its own despite being familiar. Even with the additions though, DuckTales 2 overall is nowhere as good as DuckTales and a lot of that comes down to the levels. You once again can pick which order you want to tackle the stages and there’s a lot of visual diversity found within them from a pirate ship, an Egyptian pyramid and Niagara falls. Stages once again are non-linear and there’s even more hidden treasures to hunt down than in the first game. None really stand out or make any type of lasting impact like the levels that made up the first game however, and that could possibly be due to the game’s soundtrack. While not terrible, it’s a remarkable step down from DuckTales with no stand out themes at all that will stick with you once you finish. Pick any one level from the first game, either the music or the stage, and you can probably recall the whole stage or song in your head which is far from the case with DuckTales 2. Similarly the bosses that make up the end level encounters are a disappointment. DuckTales didn’t have the most challenging bosses, but they were at the least fun to fight. DuckTales 2’s bosses range from very easy to downright tedious in the case of the Mu level’s Golem Duck. The last boss though is hilariously awesome, and I won’t spoil what it is if you haven’t played this game but needless to say, it’s very much of its time in the absolute best way. 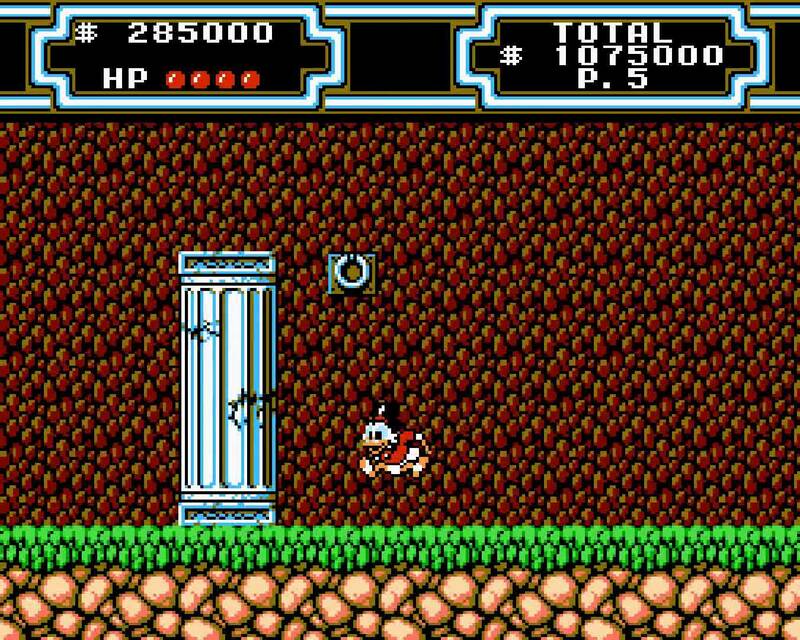 Being a late NES game, DuckTales 2 at the very least is a great looking game with a lot more effects going on within stages than the 1989 original. DuckTales 2 on the NES is a respectful sequel, but not as good as the original which is the exact opposite case with the Game Boy game of the same name. DuckTales on the Game Boy was the same game as the NES with a few minor changes and controls that didn’t feel quite as precise as what they should be. DuckTales 2 on the Game Boy has all the same level themes, refined pogo control, new moves and shop from the NES game, but the stages themselves are more noticeably different from the NES game. 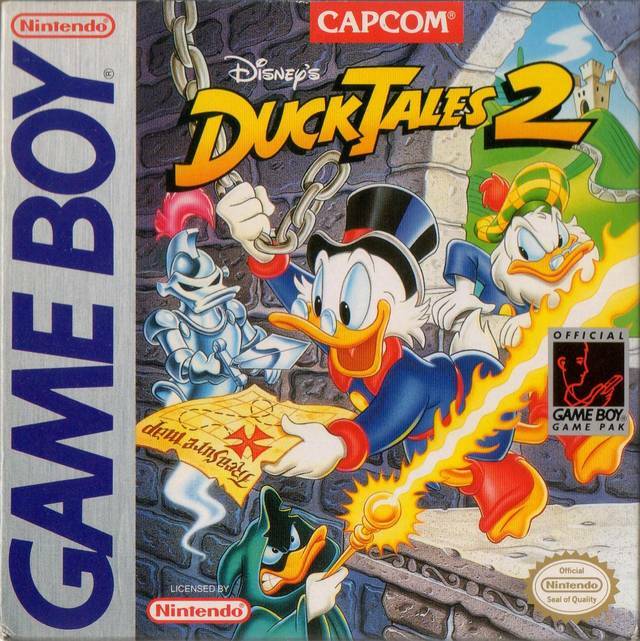 This makes DuckTales 2 stand on its own more as a game than just being a simple port and while both this and DuckTales are worth owing on the Game Boy, DuckTales 2 is the game you should get first if you own neither. Despite adding more moves and better controls than its prequel, DuckTales 2 is nowhere near as memorable as the classic NES original. This doesn’t mean that DuckTales 2 is a bad game though, as if you liked DuckTales, you’ll like this game as well, just adjust your expectations accordingly. DuckTales 2 is a good game, but one that definitely doesn’t warrant the high asking price that it has on the secondry resale market. Luckily though both this and the original game can be bought as part of the Disney Afternoon Collection for a very low price, and it’s a collection you should get before an inevitable license expiration prevents it from being sold.